Other than its lack of in-house wifi (which we solved by bringing our own), we were pretty happy with our hotel room in Menton, which was Hôtel Club Le Balmoral. The hotel’s location, I think I noted, was fantastic: very central, facing the beach on one side. The room and bathroom was a good size (for Europe), and—a feature I find annoyingly rare in hotels—was furnished with well-placed desks and shelves and full-length mirrors, such that we could set up to work on our tablets, easily arrange the toiletry items, and confirm that in fact my outdoor clothing really didn’t match from head to toe. 🙂 The room temperature was a little bit of an issue until we remembered that with European hotels, you can actually open the window (no screens! ), and the natural bit of air conditioning did the trick there. So the only problem was the food. It wasn’t all dire. They certainly used a good supplier of food ingredients such that breakfast buffet, which we had every day, was very good: delicious croissant, very fresh fruit salad, nice cheese and ham. Similarly, the cheese course that was always included with dinner featured some wonderful French cheeses. And whoever did the desserts had some talent; those were always nice—lemon meringue pie, ile flottante, crème caramel. But the cooking was a problem. Overcooked, dry fish. Under-seasoned soup. Mushy, overbreaded shrimp. Spring rolls so tough you could barely cut through them. Oy. 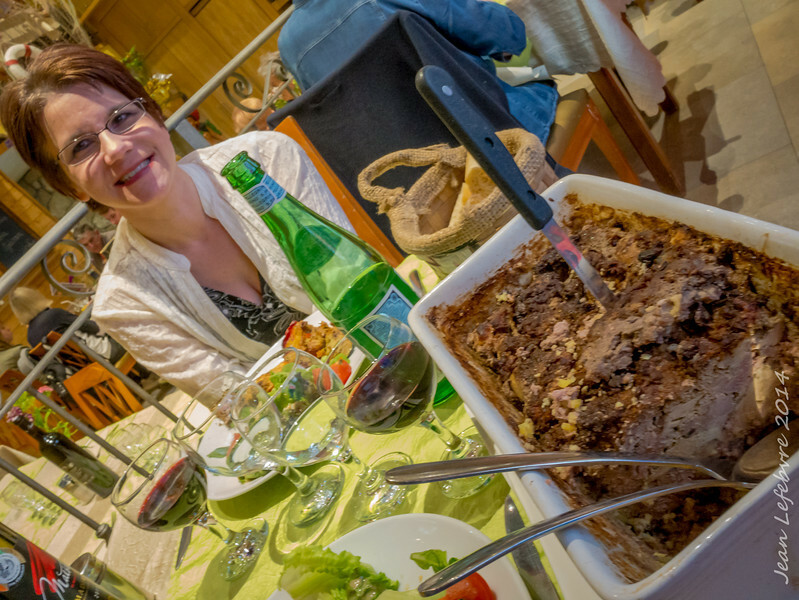 They were somewhat better with meat—the lamb tangine we had one night was probably the most successful of the week’s entrees—but it was definitely disappointing to be in France and not be able to count on getting great food. Fortunately, the restaurant meals did make up for that, to some degree. Best of the lot was Table d’Oc, which I’d read about before leaving, and which ended up being very close to the hotel. 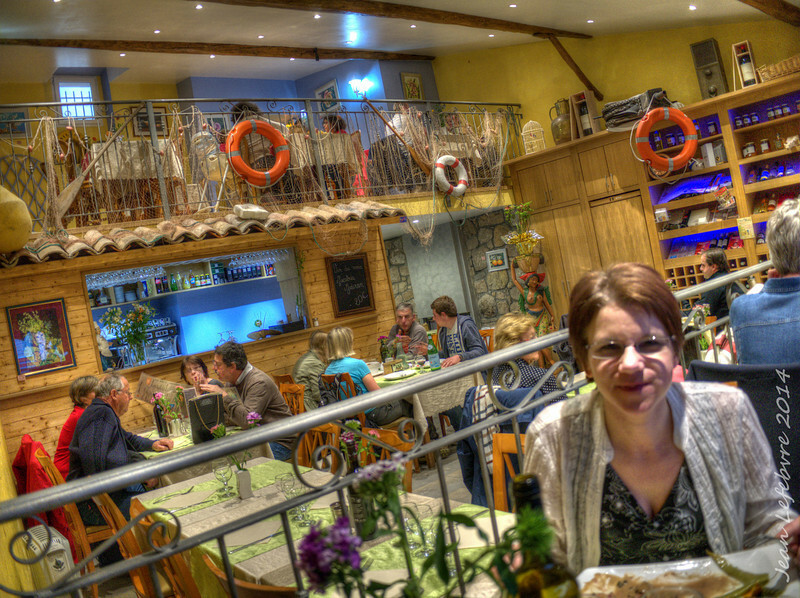 It was a small, funky, fairly casual place with a nautical theme, despite not being particularly focused on seafood. Prices were quite reasonable, offering three-course meals for 21 Euros (about 32 dollars). He found it some of the best cold foie gras he’d had, but nevertheless managed to leave some of the container for others. As a main course, I had more duck, sliced and served in a pepper sauce. That came with carrots, long green beans, and scalloped potatoes. All very good. Jean had the pork and morels, which tasted amazing, and the same veg as I. Except for an unusually long wait for the bill, it was quite a lovely evening out. Another pretty successful meal was at Le Cirke, which I read about in The Guardian. This was a somewhat more expensive seafood place. Jean started with a seafood soup, while I had an octopus and white bean salad. 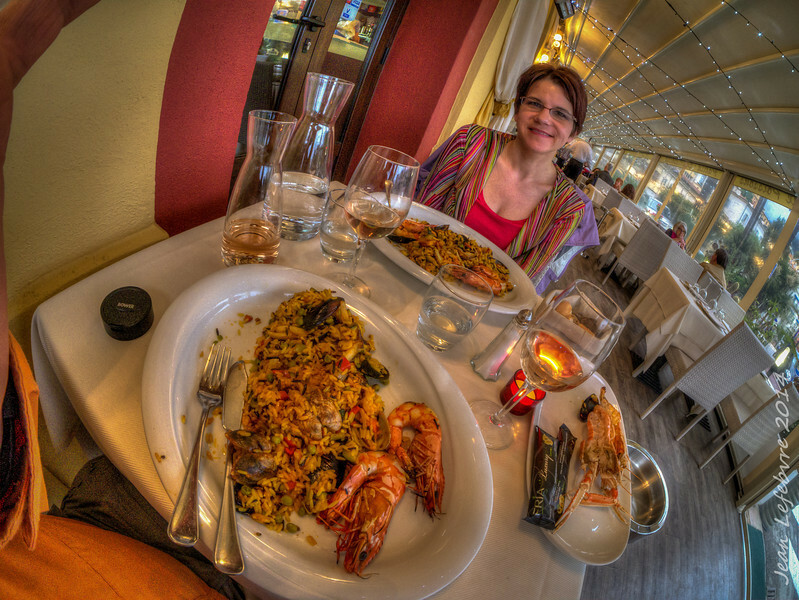 Then we shared the paella, which contained only seafood—no chicken, no sausage. All well-prepared and tasty. Lunch most days was on the trail, so was basically unexciting sandwiches and granola bars. 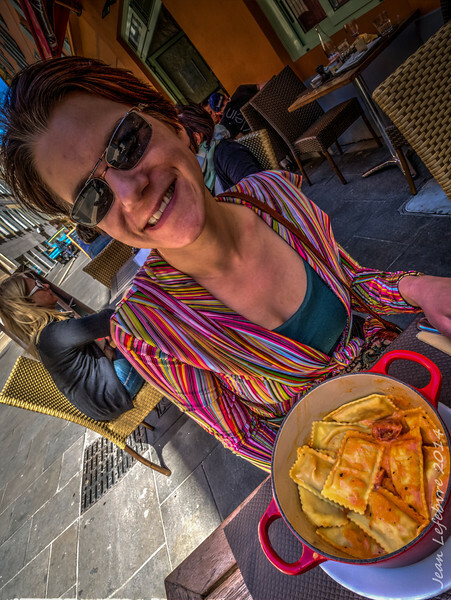 But in Nice on our free day, we did have lunch at a bistro, enjoying some pasta in a pot . Later that day we joined much of the rest of the group to see what they were doing for dinner, which turned out not to be the greatest idea. I thought the group of 8 might split into 2 or 3 smaller groups headed for different locales, but instead everyone took off together, which of course made it more difficult to find a place that could accommodate us all. One place claimed to be able to, by putting tables together outside, but then he proceeded to basically ignore us for some time: no menus, no drink orders, while attended to other tables and other people arriving. Most of the group got kind of offended by this and decided to leave; Jean, I, and another lady decided to stay. Our “congenial” host than got a bit irate about the departure and started barking at us to change tables, whereupon Jean pretty much wanted to leave, also. I was kind with him on that, but the lady we were with didn’t seem to catch it (admittedly, she didn’t have as many years experience as I at reading Jean body language), and persisted in ordering us some wine. So, we ended up staying. The service did get civil, if never quite friendly (this would be a rare time you’d wish they tipped in France, so you could not leave one). But, upside: The food was really good. Jean had gnocchi with gorgonzola, followed by duck with morels. I had grilled calamari with arugula, followed by risotto with a half lobster. And it was a pleasant evening in terms of the company. But we would never go back to that restaurant again. 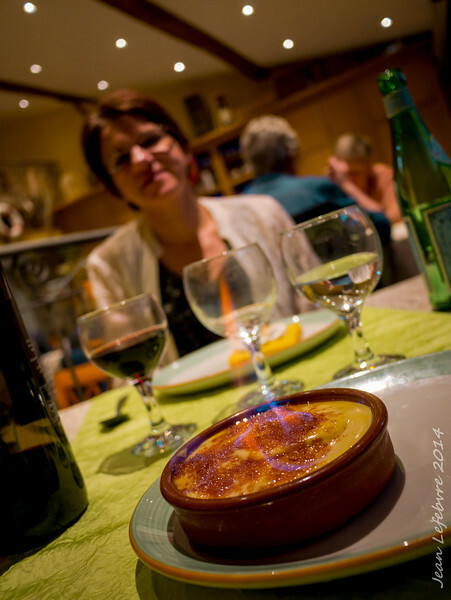 Categories: Food, Travel | Tags: Europe, food, photography, restaurants, travel, wine | Permalink. I’ve been admiring your clothes in all these restaurant pix! Really cute!